Mom’s Vegetarian Gravy – a great full flavored gravy that you’ll want to pour on everything! And, it just happens to be vegetarian, so all your vegetarian guests will love you! You’re vegetarian, what do you eat at Thanksgiving? When I first became a vegetarian I remember people asking what I ate at Thanksgiving. My answer was always something along the lines of, “everything you do, just not the turkey”. But, I’m a bit wiser now, and now I know the answer isn’t quite that simple. I mean, many of the side dishes are made with turkey or even in the turkey. The stuffing (my favorite part of the meal), is usually cooked in the bird, or at least made with giblets or poultry broth. That’s why I had to perfect a great vegetarian stuffing (find my recipe here). And, the gravy is definitely made with turkey or chicken. I tried buying cans of vegetarian gravy years ago. I made them a little better by stirring in a spoonful of sour cream, but they never came even close to the real stuff. Not only did we work on a gravy, I’d say that the gravy we made is superb! Creamy. Rich. Moist. Full of flavor. And, as far as I can tell, just as good as the meaty stuff. Now, it has been years since I’ve had the meaty stuff, but even my husband said this one was great! And, he’s a meat eater! He did say it wasn’t exact, meaning that he would be able to tell the difference, but I still consider this a big win! Now I can have gravy again on my Thanksgiving meal, my Christmas meal, or any meal in-between! Mashed potatoes and gravy? Check! Our recipe uses Better than Bouillon vegetable base. No, this isn’t a sponsored post for them, it’s just a product that I’ve come to use often around here, and I really love it. Take a look here through my Amazon affiliate link at Better than Bouillon, and you can buy some while you’re there. You can use regular veggie broth, or homemade broth as well, just sub in equal parts for the water. 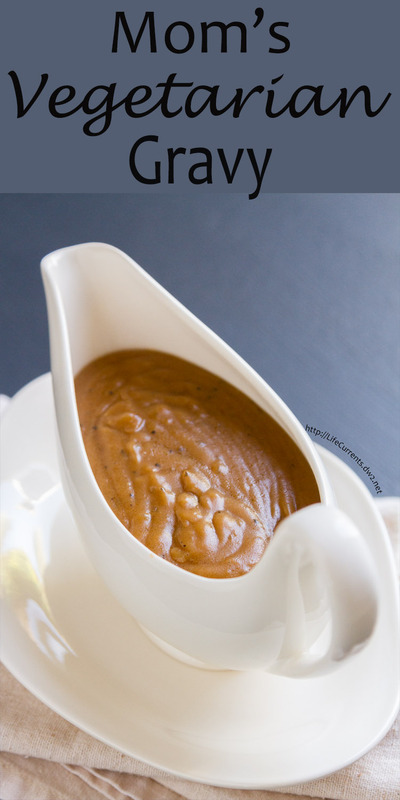 Mom’s Vegetarian Gravy - a great full flavored gravy that you'll want to pour on everything! And, it just happens to be vegetarian, so all your vegetarian guests will love you! In a small saucepan, melt the butter. Mix in the flour, and cook for 2 minutes. Add in the water, Better than Bouillon, potato starch, salt and pepper, and cook until thickened, about 5 minutes. Mixing well. Taste for salt and pepper, garnishing with additional pepper if desired. Serve hot. I made a guess at the number of servings, as it will depend on how much each person uses. The recipe makes approximately 4 cups. I am not vegetarian but this gravy looks and sounds delicious. Thanks for the recipe! Oh my goodness! Excellent gravy! I’m not a vegetarian but I would eat that gravy on EVERYTHING! I am forever trying to make a delicious vegetarian gravy. Thank you!